After many years of experience with organized travel groups as a local guide in Budapest and Hungary and as a tour manager travelling through most of Central Europe (Vienna, Prague, Bratislava, Cracow, Northern Italy and the Transylvanian part of Rumania), i am happy to invite you for a private tour into my native land. I am Artúr Izsák, born and currently living in Budapest, graduated in 1994 from the University of Szeged, Hungary. My academic background is being a teacher of languages, English and Italian, and I am truly passionate for arts and history. 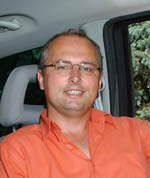 Since 1991 I am a licenced local guide in Hungary and achieved experiance in conducting tours from Warsaw, Poland to the Adriatic sea and all the countries on the River Danube from Austria to the Black Sea. I am married, father of three children and a designated gardener when my better half needs man power to the plant. performing sightseeing and other tours while here. I usually drive my own car allowing me to carry 4 adults and two children but if it is not enough, I can provide the right size of a vehicle with a driver and do the rest myself. I am friendly and flexible, passionate for combining entertainment with discovering landscape, arts and people. I am also accomodating and sensitive to the requirements of my clients from the moment planning a tour until you need to modify it to suit the moment. I have extensive knowledge on Hungary and the region, so I can easily switch for topics you are the most curious to hear about and make our excursion the right way to catch the sensation that brought you here. Building up my commentary I take great care gearing my presentation according to the personality of my guest and whenever it is possible I like to extend the range of our senses involved in the experience of travelling a foreign land: tasting local food, listening to traditional music and participating at contemporary events of cultural and social life. To make the first step in increasing your curiousity I have collected a set of my favourite tours at the ’’Program Offers”, a modest selection of the countless variety that I can propose in case you let me know more about your personal interest and travelling manners. My car is a Ford Galaxy, a European model of the Ford Corporation, which has a maximum of 7 seats in 3 rows but I normally take only 4 people what makes it really comfortable with much of room for legs and plenty of space for the luggage. It is equipped with digitally controlled 2-zone air conditioning system, air-bags, hi-fi system with CD player, reclining seats, safety belts for all the seven seats and all kind of other safety devices, too. Having not more than 4 passangers I use my own car which is an elegant limousin spacious for long distance drives but still handy in urban traffic. For the maximum of 4 passangers there are two potential seat configurations, out of them the most common is 5 seats in two rows : one seat is avaiable next to the driver and three in the back row. Plenty of room for luggage, wheelchair or anything else can be put in, as there is no need to carry 2 of the 7 seats in the third row. 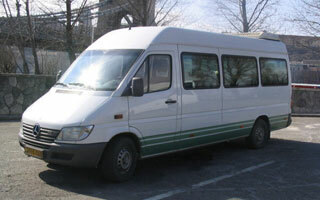 For having 5 or 6 passangers I can either use my own car or hire a large van or a minibus. 7 seats in three rows: one passenger next to the driver, three in the second row and two in the third row. The two seats in the third row are recommended to children and having 6 passengers very little space remains for luggage. 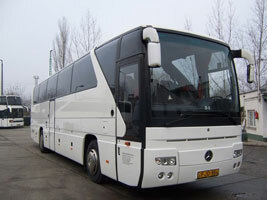 Once you choose programs and tours and let me know the number of people involved I will send my offer to you for using a minibus or a coach when travelling to Hungary.